Capt. Greg McWherter, commanding officer for the flight demonstration squadron of the Blue Angels, leads a formation of F/A-18 Hornets during the Tuscaloosa Regional Air Show in Tuscaloosa, Ala., in this March 30, 2012 file photo. With $85 billion in automatic cuts to the federal budget taking effect beginning Friday, millions of fans across the country will miss out on precision flying by the Navy's Blue Angels and the Air Force's Thunderbirds, military officials said. Blue Angels shows scheduled in more than two dozen cities between April and September are expected to be canceled as part of the cuts, said the team's spokeswoman, Lt. Katie Kelly. The Navy intends to cancel the four shows in April -- in Tampa, Fla.; Corpus Christi, Texas; Vidalia, Ga.; and Beaufort, S.C. -- but hasn't made a decision about the rest of the year, hoping to salvage some of the season, a senior U.S. military official told NBC News. Some shows featuring the Blue Angels already have been called off in the face of budget uncertainties. The Thunderbirds entire 2013 season, beginning April 1, has been canceled, the Air Force said in a statement. The Air Force said that all aviation support for the public has been halted, including air shows, trade shows, flyovers and open houses. The grounding would be a sentimental loss for fans but not as serious as other reductions to defense spending, which President Barack Obama said could threaten military readiness. The Defense Department said the cuts would slash ship and aircraft maintenance, curtail training and result in 22 days' unpaid leave for most of the Pentagon's 800,000 civilian employees. For the Navy, programs such as the Blue Angels would take a back seat to "making sure ships are seaworthy and planes are airworthy for the war fighters who are operating overseas," said Lt. John Supple, spokesman for the Chief of Naval Air Training in Corpus Christi, Texas. The news has saddened longtime fans, disappointed city leaders and sparked an online petition to the White House to save the Blue Angels' season. About 1,200 people had signed as of Thursday. 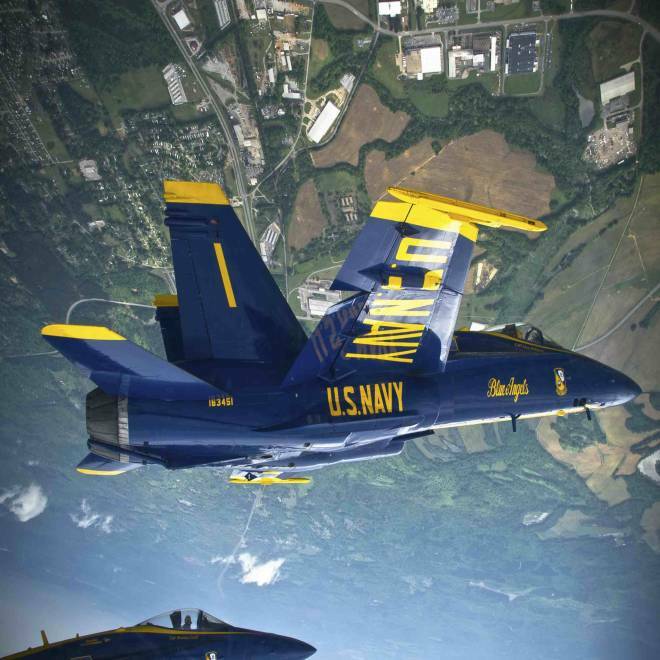 "They're an American icon, and they really resonate in a military town," said Ashton Hayward, mayor of Pensacola, Florida, home to the naval air station where the Blue Angels are based. Members of the Blue Angels aerobatic team perform during the Andrews Air Show at Andrews Air Force Base in Maryland, in 2006. Pensacola's Blue Angels beach show each July pumps an additional $2.5 million into the local economy, according to a 2012 study. "People plan their annual family trips around the shows and the impact on business is phenomenal," Hayward said. "If the Blue Angels end, it's going to be a sad, sad day for not just us, but for millions of people all over the country." Air shows scheduled for May at Seymour Johnson Air Force Base in North Carolina, and for June in Indianapolis, already have been canceled, organizers and U.S. Air Force officials announced in recent weeks. The budget cuts will affect cities from Seattle to North Kingstown, Rhode Island, where the Rhode Island National Guard Air Show draws thousands of visitors to the small town each year. The city's Quonset Air Base closed in the 1970s, but a sense of military pride still runs deep. Losing the Blue Angels would deal a huge blow for the show in late June, said Elizabeth Dolan, North Kingstown's town council president. "Everybody looks forward to when they come," she said. "They fly right up over my house, and it's amazing and emotional to watch." The Blue Angels program began in 1946 and costs about $40 million a year. Cancelling the bulk of the performing season would save about $28 million, according to Navy officials. Because of the timing of the cuts, the Angels will still perform in March at the El Centro Air Show in southern California and the Southernmost Air Spectacular show in Key West, Florida. The 130-person team, which includes seven pilots, consists of members who have served in high-level tours in Iraq and Afghanistan. Should the budget cuts go into effect, the team would be reassigned until there is enough money for them to take to the skies again, Supple said. Pilot Dave Tickle, a 32-year-old from Birmingham, Alabama, said he was inspired to become an expert naval pilot after watching Blue Angels performances during family vacations to Pensacola when he was a child. He is now a lieutenant commander in the Navy and the Blue Angels' lead solo pilot. "I remember looking up at these shining blue and gold precision aircraft and thinking, 'I want to do that.' It gave me a feeling of amazement and pride," he said. NBC News Chief Pentagon Correspondent Jim Miklaszewski and producer Courtney Kube contributed to this report.